APAA – A delegation of Members of Parliament (MPs) led by Leader of Opposition, Betty Aol Ocan and Opposition Chief whip have been blocked from speaking to the displaced people on the disputed Apaa land. The MPS who had gone with a number of local leaders and reporters were denied to speak to locals by security forces guarding the area in Juuka, in Apaa land. 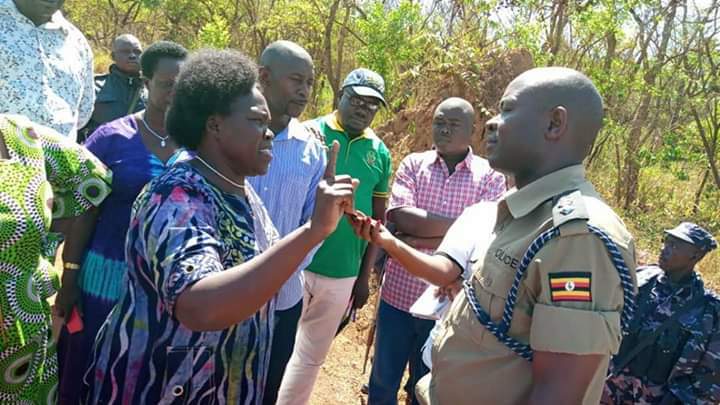 A security officer told MPs that they had received orders from Police top leadership not to allow MPs and the media to tour the contested area. The contested Apaa land negotiations recently suffered yet another setback as leaders from both Acholi sub-region and Adjumani District failed to agree on President Museveni’s options of ending their long-running wrangle. The contested land borders Amuru and Adjumani districts. In December last year, the eight-member committees from both Acholi and Adjumani districts held another consultation meeting over the disputed land but failed to reach a consensus. This third round of negotiations was chaired by Prime Minister Ruhakana Rugunda and held at Gulu Presidential State Lodge. Aol Ochan, on Wednesday, February 13 started a weeklong tour that will see her visit schools and hold meetings with local leaders in the region. Aol Ochan is leading a team of Members of the Opposition an oversight visit to assess the status of infrastructure, quality of services in the health facilities and working conditions of the health workers. The Opposition is also seeking to know the rate of girl child school dropouts, status of provision of sanitary towels in schools and the overall management of refugees in camps.